This Coca is sold all over the island by bakeries and supermarkets. Sieve flour into bowl with salt and baking powder. Add oil and water and mix into a dough ( I use a dough hook but a fork works just as well). Spread dough using fingers and palm of hand on a baking tray (about 40 cm by 30 cim) and create a rim around the edge. It is not necessary to grease the baking tray. 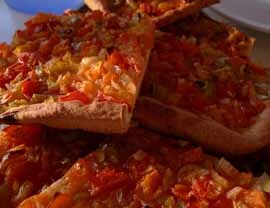 Finely slice tomatoes and onions (food blender is useful). Sprinkle a little olive oil, salt and organo over the top. Bake in oven for about 40 minutes – 10 minutes at 200° C and the remaining time at 180° C. Check that onions are tender.